Attention, Agents of America: Your Non-standard Homeowners Market is Served! 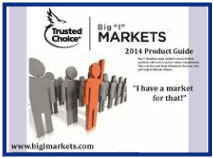 Big "I" Markets is pleased to announce that our non-standard homeowners market is back and bigger & better than ever! Our agents asked and we listened… and now we're serving up an amazing market with a focus on superior customer service while also opening up states and risk characteristics previously discontinued. We understand that NSHO can be difficult to deal with, but having a great go-to market is an important piece of the puzzle for agents. 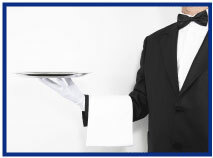 That's why as your association we've worked hard to serve up a fantastic solution on a silver platter. And as with all our markets on BIM, there are no minimums, no fees, and you own your own expirations. This market is now available in all states except for Hawaii, and is accepting PC 9/10, builder’s risk, renters & condominium risks once againavailable in all states except for Hawaii. The Non-standard Homeowner or Rental Dwelling product is now available to members in all states except Hawaii. Each year we publish a paper guide for Big "I" Markets, which is delivered to Big "I" member agencies the old-fashioned way, through the mail. We're pleased to offer Two for Tuesday readers a preview of this guide, which gives an overview of most markets available on BIM. Our cover this year has the phrase, "I have a market for that!" And that's just how we hope you feel after reading through the wide array of markets available to you as a Big "I" Markets agent. Take a moment to flip through and perhaps discover a gem you hadn't noticed before. 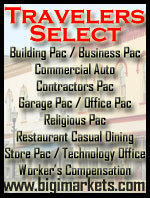 Having difficulty finding coverage for your vacant dwelling? Big "I" Markets can help. We have an A Rated Excess & Surplus Lines carrier offering dwelling fire insurance for risks other carriers decline or are unable to write. This product is also part of the re-expansion of the Non-Standard Homeowner program and has been opened up in the states and risk characteristics previously discontinued, including PC 9/10. Ineligible risks include knob and tube wiring, homes in poor condition/poor maintenance; mobile homes; risks with open claims. Risks with more than 2 family units, business or day care on premise may be considered on a case-by-case basis. 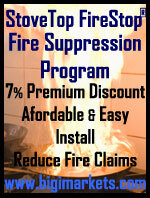 Submit a quote request with a complete detailed explanation for consideration. Wind and earthquake coverage options may be available. The Vacant Dwelling Homeowner product is now available in all states except Hawaii. 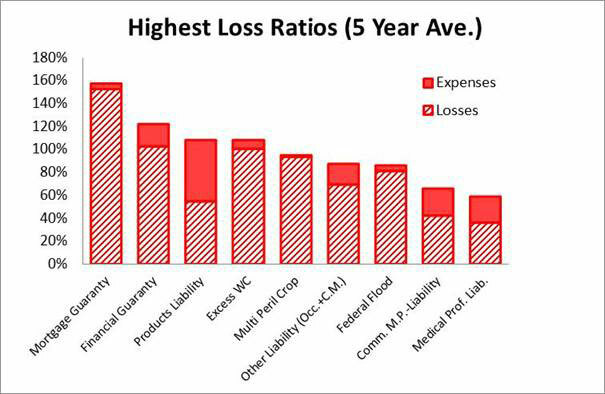 This week we tie together the loss payments and the loss adjusting expenses and graph the highest total Loss Ratios. Wow. Since the five years include the aftermath of the 2008 Financial Crises Mortgage Guarantee tops the list. If insurers had a way to get off those risks in 2009 they surely would have. 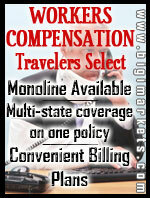 Claim trigger and cancellation wordings are important details in those policies. The Products LOB looks like a good line until you realize how expensive it is to referee the claim. Oh, if anyone can give me a logical explanation why ALAE on Multi-peril Crop is so low (1.5% of premiums in 2013), I’ll learn something from this week’s Student of Insurance from you! Email me at Paul.Buse@iiaba.net. As a quick reminder, the “Losses” shown as diagonally stripped bar sections are actual loss payments for property loss or indemnity/liability and the “Expenses” shown as solid are the costs of investigation, attorneys and other loss investigation expenses incurred in getting to a claim payment amount (aka “ALAE”). As a point of reference on a line that was not in the “best” or “worst” the last two weeks, personal lines automobile insurance has a loss ratio of 78% with 2013 direct written premiums of a whopping $180 billion. That’s just over 1/3 of the total P&C insurance industry’s total premiums annually. Source: A.M. Best Aggregates and Averages. Note Ratios are loss cots to Direct Premiums Earned. 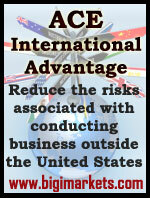 Congrats to our agent in Georgia on a commercial lessor's risk sale of $16,377 in premium!